Big congratulations to all candidates who dedicated their lives for the past few months running for office. 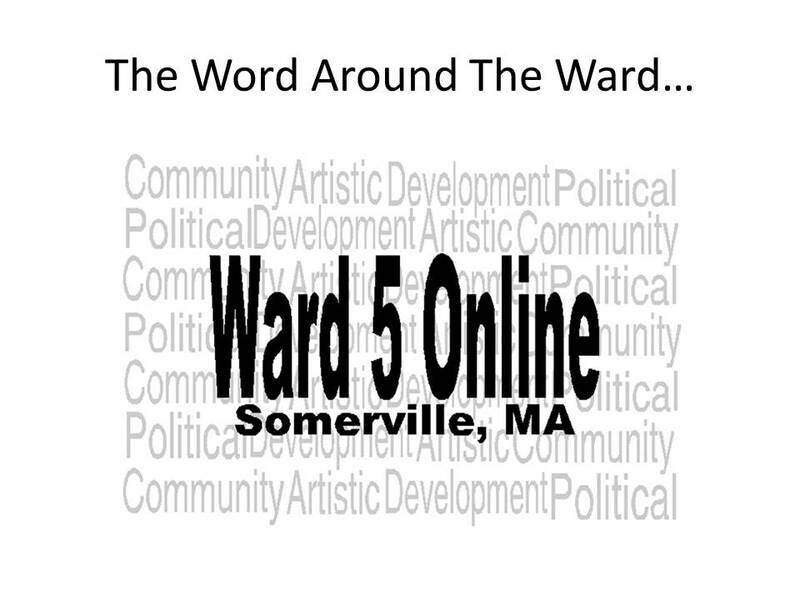 2014 is going to be an interesting year and I look forward to covering it all on Ward 5 Online. The sudden resignation of Chief Pasquarello has sent waves throughout the City and already has the conspiracy theorists rumbling. I wish Tom and his family the best of luck and look forward to the process of hiring a new Chief. 215 Highland Avenue may be home to a new pizza place soon. The word around the ward is that an application is being sought to open the vacant storefront before the end of the year. No word on what’s happening with 517 and 499 Medford Street in Magoun Square. 517 is set to be an ice cream/bakery with 499 slated to open as a Chinese eatery. Penny Packers has opened and is making quite an impression on residents with their eclectic menu and great prices. Developers of the 235 Lowell Street project have requested a continuance until December 11th through the Zoning Board of Appeals. A 6-unit residential complex has been proposed for the space. All are invited to City Hall on Friday November 8th at noon for a MIA-POW chair dedication. This chair joins 42 others throughout Massachusetts and will be placed by the City Clerks Office. Both of those stores have been papered for a while. Can you find out what's happening before you leave office and that jerk takes over? I know he won't be on the ground-level like you are so I wanted to ask before you left. We love you Courtney! I'm still convinced that if you hadn't been appointed, you'd have won in a romp. it was an anti-"establishment" type of year, voting away (by and large) anyone who even hinted at having connections to the administration. McLaughlin in Ward 1 won with only about 115 votes, after he decimated LoRusso and Bastardi in the primary. He then got the Mayor's endorsement and his luster started to fade among many of the "progressive" types. McWatters in Ward 3 won with fewer than 100 votes, and I'd be surprised if he isn't challenged next time. Ballantine won in Ward 7 because of her previous run vs Trane, she's older with a family (instead of Capuano, who's young and single), and she went negative on Capuano early and quietly, trying to link him to some alleged "conflicts of interest" from his day job. Capuano should have fought back instead of be above board. - Congressman Capuano stays in the House until he retires at the age of 80. - Joe Curtatone, with no congressional or governor seat to try for, decides not to run for re-election and takes job as regional HUD or Transportation director for Obama, gears up for lucrative private sector job. - McWatters is challenged, wins narrowly. - Bill White postulates for Mayor on his independence against Curtatone. Gets the support of many residents for his intelligence and willingness to go it alone on the BOA. Nominates. - Dennis Sullivan postulates for Mayor, realizes the "running as a slate" thing doesn't play well with voters despite his "mobile office hours" with no real achievements to date and does not nominate. - Tony LaFuente postulates for Mayor, runs on thin resume in Ward 4, but his lack of appeal in previous citywide races has not left, and his thin record leads him to not nominate. - Gewirtz postulates for Mayor, gets the support of Ballantine, Neidergang, Sciortino, Jehlen, Provost, splits the "Who Hates Curtatone More" vote with White. Runs as the "new progressive machine," but fails to nominate when people are reminded that they do not like "machines." - Mike Capuano Jr postulates for Mayor, gets the support of McLaughlin, McWatters, Rossetti, Curtatone, Toomey, DiDomenico and Marty Walsh, runs on his independence on the Planning Board and intelligence. Nominates. - Jehlen retires, Sciortino and Provost run for Senate, Sciortino wins. Joe Capuano and LaFuente run for Sciortino's seat, Capuano wins. If Provost wins, Gewirtz runs vs Heuston, Gewirtz wins. They are all sleeping together. The problem with the job of police chief, and other department heads, including the fire deparetment, is that they are being micro-managed by the board of alderman. Count the number of times over the years, that the city departments heads have been called by the BOA to "answer/explain"
Another problem: over the years,department heads have been appointed/approved soley based on their political connections. Once these people gain some "experience"----they are off to take a higher paying job elswehere where micro-management is virtually non-existant. it has happened in Somerville time and time again over the years. If I was to guess, the next department head to go will be the superintendent of schools. With Mark Neidergang now on the BOA we can expect the micro-managing of departments and department heads to rise to another level. Particularly those department heads, such as Stan Koty, closely tied with former Alderman O'Donovan. It's no secret in the ward that Joe Lynch, a strong supporter and endorser of Mark Neidergang, that Lynch took every opportunity to criticize O'Donovan's actions as alderman. With other O'Donovan's clique on the BOA, consisting of Bill Roche and Bruce Desmond, all no longer on the BOA; Joe Lynch, through Mark Neidergang, will have a field day asking those department heads to come before the board for some micro-managing. One has to be cognizant of the fact that O'Donovan, albeit he resigned, did want Courtney O'keefe to fill the Ward 5 alderman chair---and he and his people worked hard, and expensively to that end. If Courtney was re-elected it would of been tantmount to O'Donovan still calling the shots in Ward 5----without his physical presence being needed; and not having to put in the man-hours at committee meetings.